On March 29, we were featured on Generation Bold Radio hosted by Adriane. 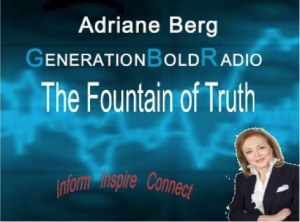 Host Adriane Berg and her battalion of experts come to the rescue to bring you the “Fountain of Truth” about Boomer lifestyle and fulfillment. If it is in your life, you will hear about it on Generation Bold. Health. Wealth. Travel. Relationships. Home. Spirituality. Sexuality. Older parents. Boomerang kids. Grandparenting. Generation Bold: Talking About What Really Matters to You. You’ve seen her on Oprah, GMA and Fox News. You’ve read her books and blogs. Now talk with her on the radio. Click the following link to listen to the interview or listen via SoundCloud.